Hi all. I'm new to the forum, been on it for a few months and love it. First post and need help.. 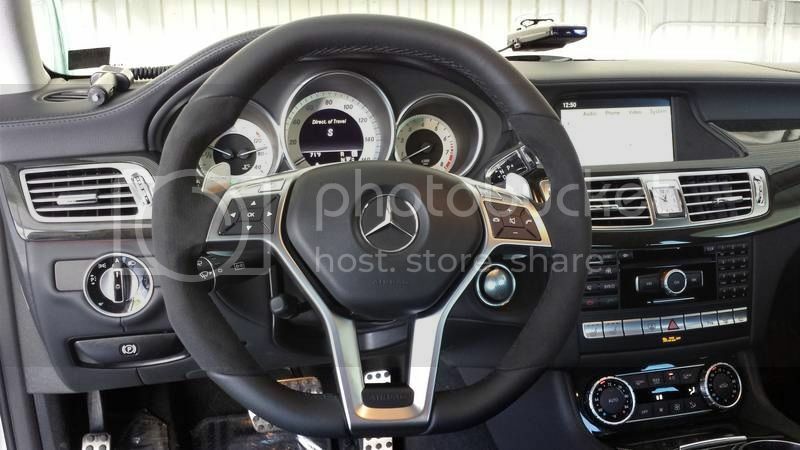 I have a 2012 CLS550 with std steering wheel. Purchased a new wheel for the CLS63 with performance pkg that has the alcantara sides. Removal of old steering wheel easy and straight forward. Installation of new one also easy and straight forward. Looks great and achieved the look I want, problem is no buttons function and paddle shift doesn't work. Anyone have an idea of what this may need, program of sort or ? I mean steering wheel controls on both wheels identical. Very strange. Last edited by Micros73; 10-07-2013 at 11:57 PM. Last edited by Micros73; 10-09-2013 at 02:16 AM. I will do write up regarding everything that I learned and will provide pics this weekend when I do the entire swap. 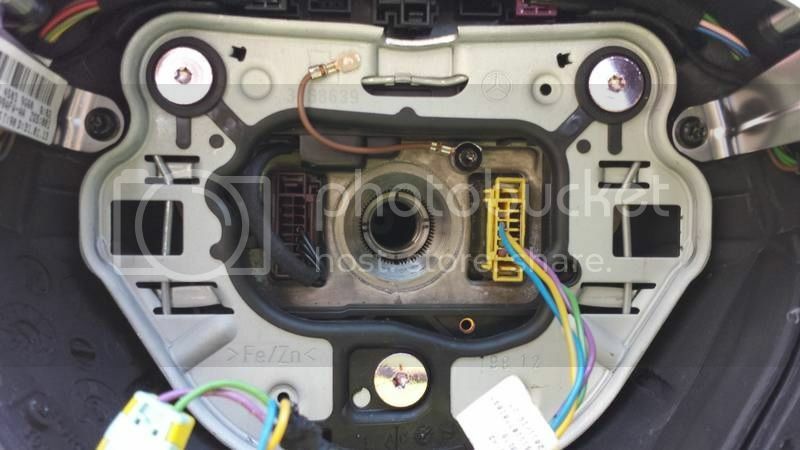 Ok I will try and make this as short as possible but be thorough..
Now first off you will need to disconnect negative battery terminal which a 10mm socket is required. Battery located on pass side next to firewall. 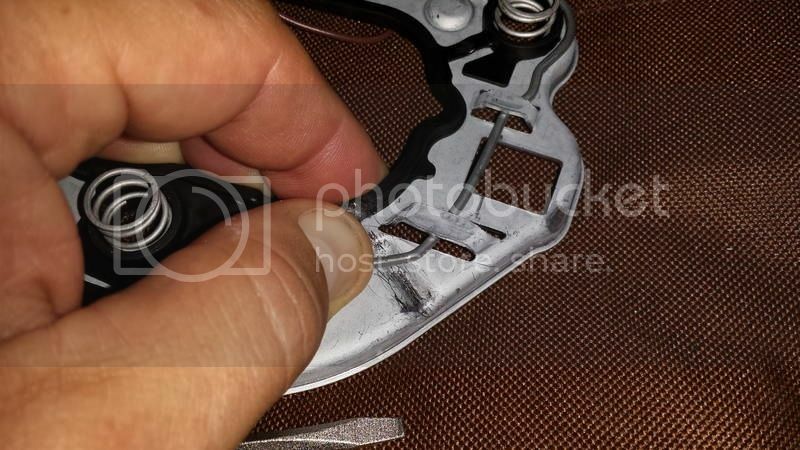 Battery has a plastic cover held with 3 clips. 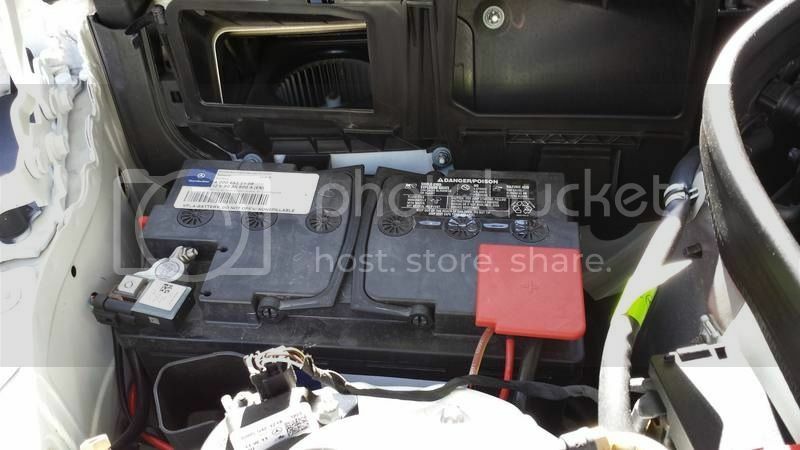 Next open a door and that should drain residual battery in system, should hear an electric motor go off for a few seconds. Once you don't hear anything you can start to remove airbag. 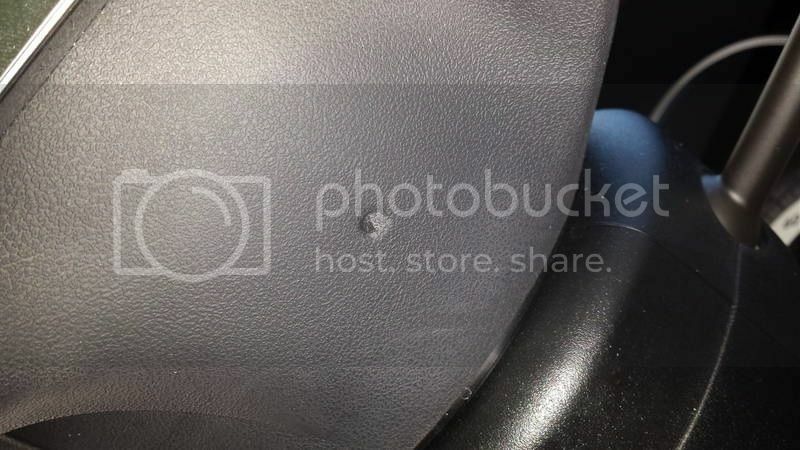 There are 2 dimples in back of steering wheel in which you can first stick a small pick through to make a small tiny hole. 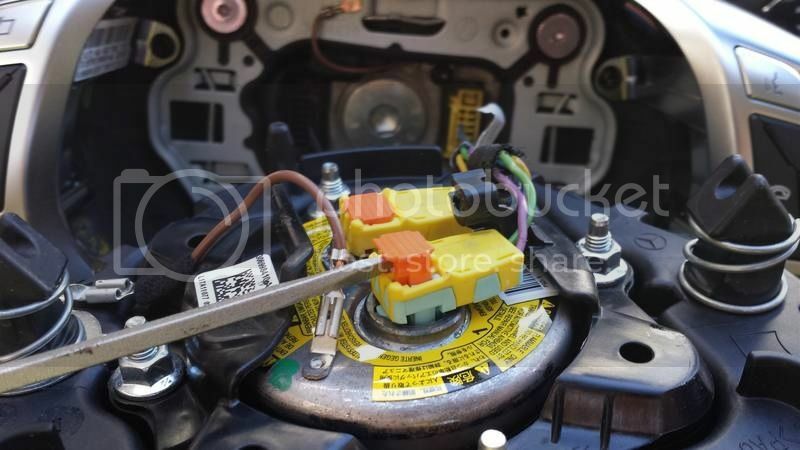 I then used a very small screwdriver as I needed a flat tip in order to depress the springs that hold airbag on. Be patient when sticking the screwdriver in the hole, more you play with it the bigger the hole will become. You don't need to stick screwdriver in very far at all. Feel for the clip to give when you push, should be springy. If you find it push until the airbag pops out on the side your working on and continue to next side. Once both clips are depressed you now can pull airbag down and work on removing the 2 airbag plugs. Put the screwdriver in the plug tops and wiggle the top clip up then remove the clips. Once that is done take a 10mm Allen socket with breaker bar for leverage and break loose the screw in center. This is on there so use some muscle. It has blue thread locker so when replacing don't forget to dab a little blue thread locker back on. 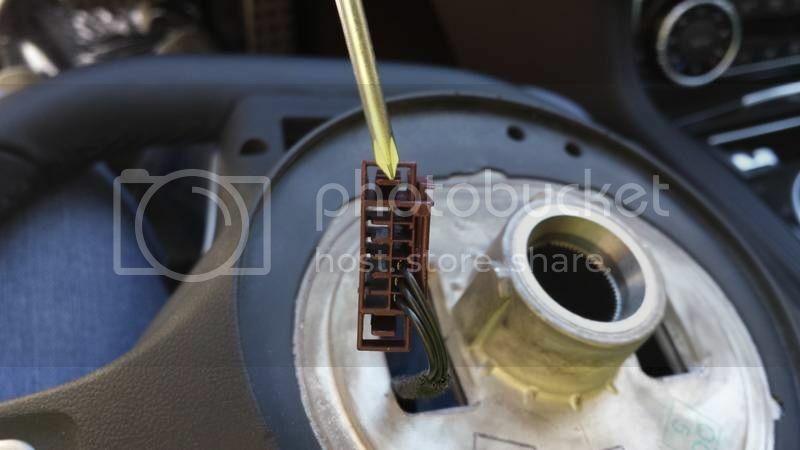 Now remove the brown plug on left hand side attaching to steering column. There are small push clips on top and bottom of clip, push in and pull out plug. The right side yellow plug does not need to be removed, but I took it off anyway, that comes off same way as left side. At this point make sure steering wheel is straight and you can mark if needed, but if steering wheel is straight you will see factory black marks that line up with the groove on top. Steering wheel will pull right out. 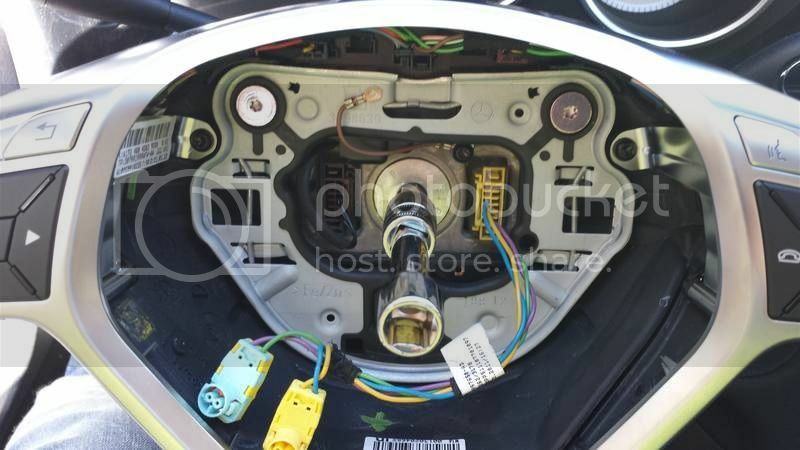 Now if you are replacing a 2012 wheel with a 2013 or newer wheel you need to use your old contact plate to retain all the steering wheel functions. I learned this the hard way after swapping wheels and nothing worked on wheel, horn, buttons paddle shift. So I learned that new contact plates are not compatible with 2012 models. If contact plate swap is necessary this is a very easy and straightforward job. Remove the 3 main torx screws shown here. And also the small black one holding the brown wire to wheel. 4 torx screws in total need to be removed. Once that has been done then you can pull metal plate up and the plastic electronic plate will be below. 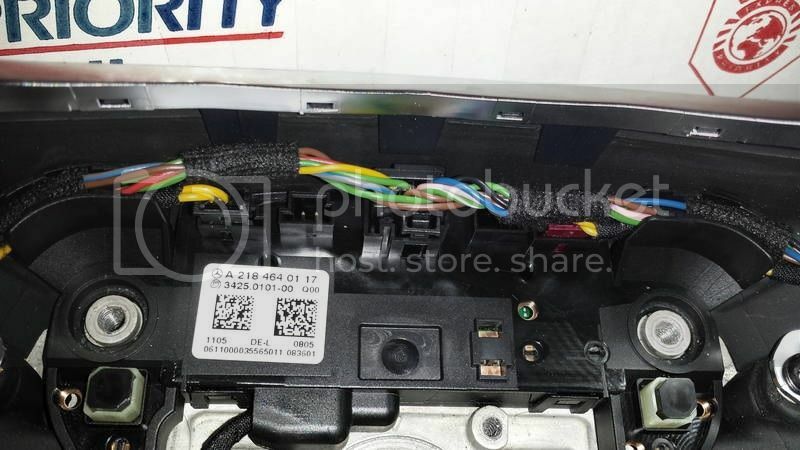 Now you need to remove the 3 electrical contacts off. They are held in with single clips that need to be depressed and pull out. Once this has been done reverse all instructions and put in old contact plate onto new wheel. Check to make sure you plugged in everything correctly and use a dab of blue loctite on the 10mm Allen screw. 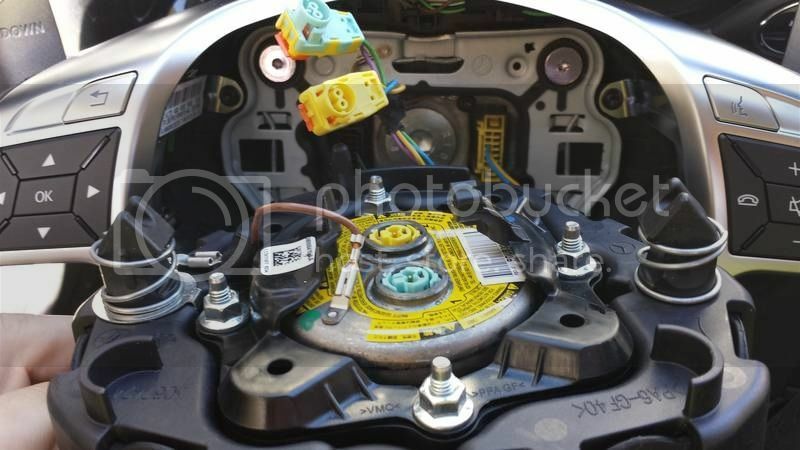 Once you plug everything in and torque down your Allen and plug in airbag, airbag simply snaps into place. Plug in battery and test. If anyone is in south OC you are more than welcome to stop by my place and will complete job for free. I can do it start to finish in about 20 min. Last edited by Micros73; 10-13-2013 at 04:38 PM. What a informative write up! Nicely done. Where did you order the cls63 wheel? I had a cousin in Germany send it to me, this was just a lucky thing as he had access to a brand new one. But I see them on ebay every so often, put "amg steering wheel" in search. There are quite a few different variations, prices are $1,250- up. It's night and day difference in feel of the thicker wheel, alcantara and flat top n bottom. Awesome write up. We need more postings like this to really get the owners' community DIY momentum going for our C218s. Very Nice.....thanks for taking to time putting this write up together! No worries guys.. If it helps one person it was worth the post. Even though I destroyed my factory steering wheel trying to figure out how those damn spring clips work. But well worth it!! Trust me clips are NOT easy to release, and I'm beyond patient.. It will sure help me! I just ordered one from Germany for $1,250. All leather though. 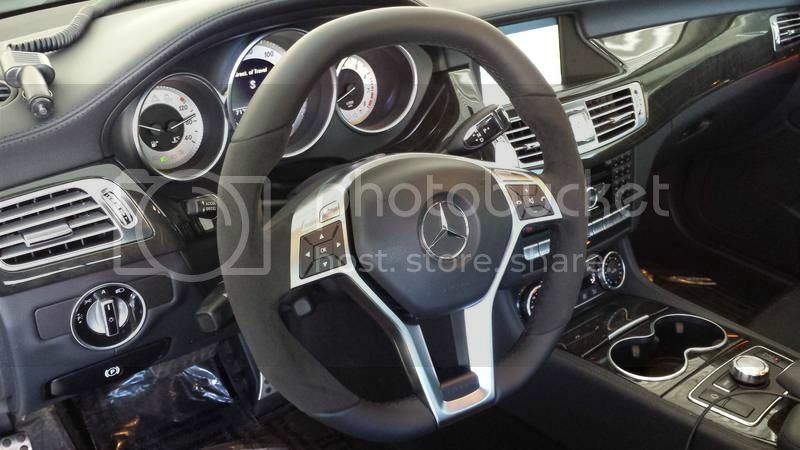 Quick question ... do you know if the OEM CLS 550 air bag & cover with MB logo is transferrable to the AMG steering wheel? Yes it's the exact same airbag no difference in the 2012-current yrs.. I just ordered the AMG full leather steering wheel and was told that the covers are not compatible. Attached are the photos I was sent. 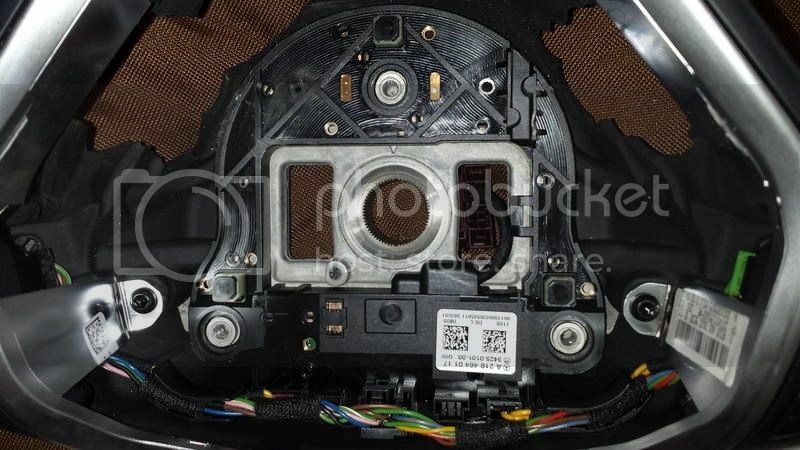 Note that the word AIRBAG is not on the AMG sw.
[QUOTE=im4umia;5819618]I just ordered the AMG full leather steering wheel and was told that the covers are not compatible. Attached are the photos I was sent. Damn you im4umia!! You have proven me wrong.. you know I was wondering about that gap I had but upon inspecting both wheels, to the naked eye they look the same. horn functions etc and not once did anyone mention I needed a new airbag.. Now I guess I will be replacing airbag. I will make this correction on the write-up as well. Great job pointing that out. Now question back to you, you stated "cover" not actual airbag. They don't just sell or make a cover its the entire airbag yes, please correct me if I'm wrong. And where did you purchase it from? I purchased it on Ebay from a German company. They sell the steering wheel with and w/out the airbag. Both items cost $1,250. St-wheel w/o the airbag is $900. They sell the airbag w/cover for $380 + $40 shipping. BTW, I was truly just asking! Didn't mean to trump you there old boy. Frankly I thought I'd been had. Great thanks.. And I have indeed been trumped haha. I'm glad you caught it, we are all here for a common goal. Got the air bag off easy enough, but I cannot get the center screw to budge. Am turning the Allen socket counter clockwise....assuming that is the correct direction for screw removal. Any ideas? My hands are pretty raw. Is it the small screw sized one with the single brown wire your referring to? I was referring to the primary mounting screw with the lock tight tape. I got it off with a pressure wrench no problem. 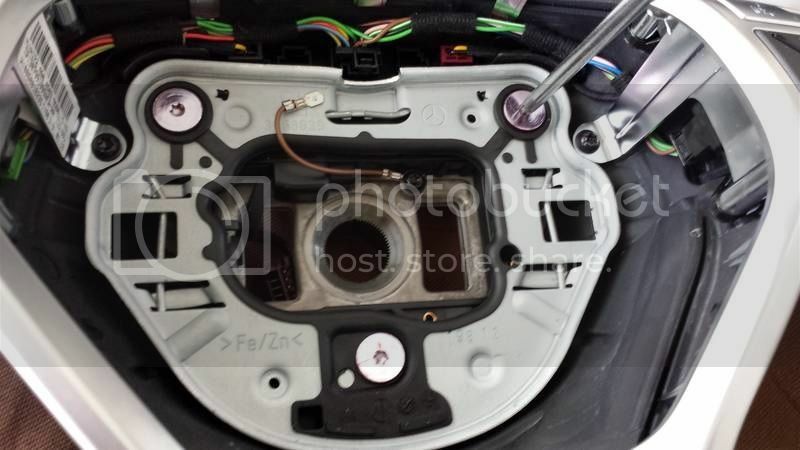 Where you reference: "Now you need to remove the 3 electrical contacts off. They are held in with single clips that need to be depressed and pull out." Those came out no problem, however there's a 4th white clip on my (2012 CLS550) wheel. It sits between the large black one and redish one shown in your photo. (In your pictures the outlet is empty.) It has 2 wires, red & black. I'm guessing this is the power connection. I could not get it out and ended up using pliers which cracked the white plug casing in half. I cannot remove the half that remains in the contact plate plug outlet. It appears to have been blued in place. It will not budge. The 2 wires (red & black) are sitting bare now. This white clip is also present on my AMG steering wheel. 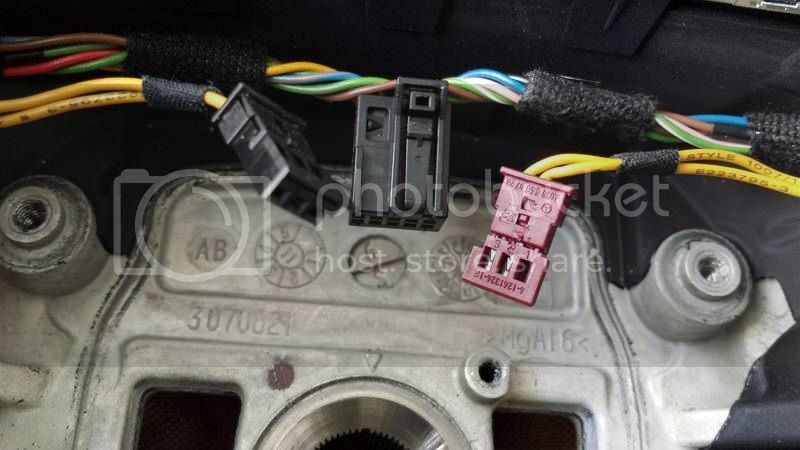 This plug is also on the AMG steering wheel and I have no idea how to remove it...never mind how to connect it to the old contact plate. I have not disassembled the AMG steering wheel yet. Last edited by im4umia; 11-06-2013 at 08:53 PM. 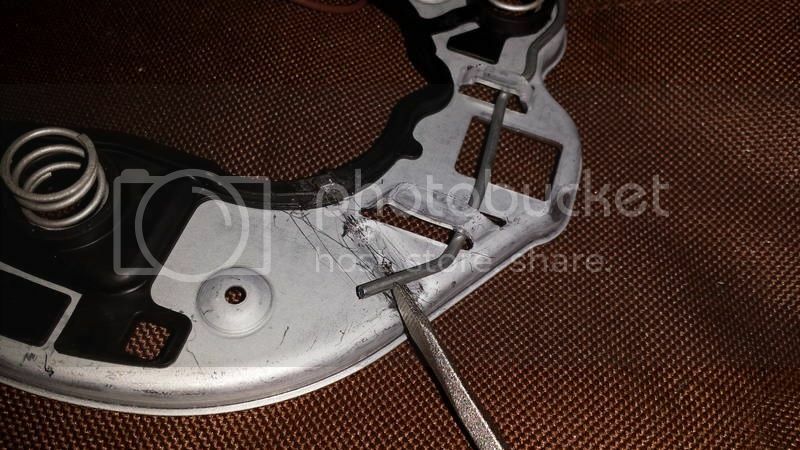 I was able to remove the circuit board cover and completely remove the circuit board from the original contact plate. Tomorrow I will attempt to swap it with the AMG circuit board. 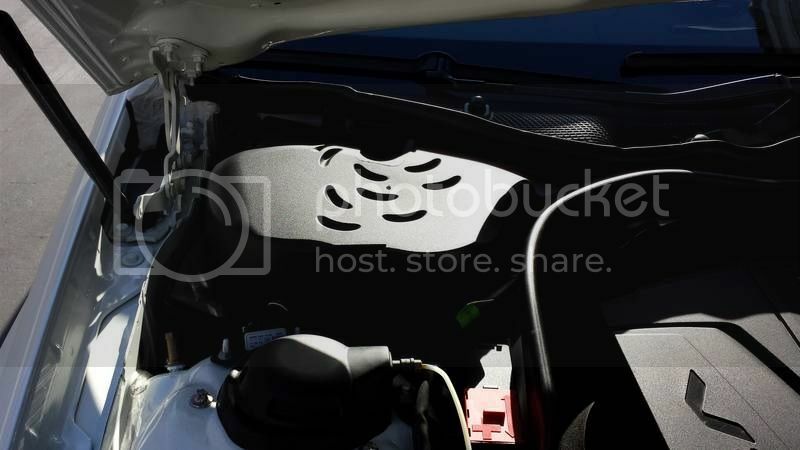 So basically, instead of removing and swapping the contact plates, I will simply attempt to replace the AMG's guts. ps - the white plug was not glued in. It was super tight. Once I removed the circuit board I was able to push out the half of the plug still in the outlet from the bottom. Ok I'm guessing you may have lane tracking and that might be the plug for one of the options I do not have. I was going to mention that I don't think it's glued in, just very snug. One of the other plugs on mine was same way, I had some really thin picks that I was able to use to just slowly wiggle it and finally pull out of place. So are you glueing the broken factory plug back together? 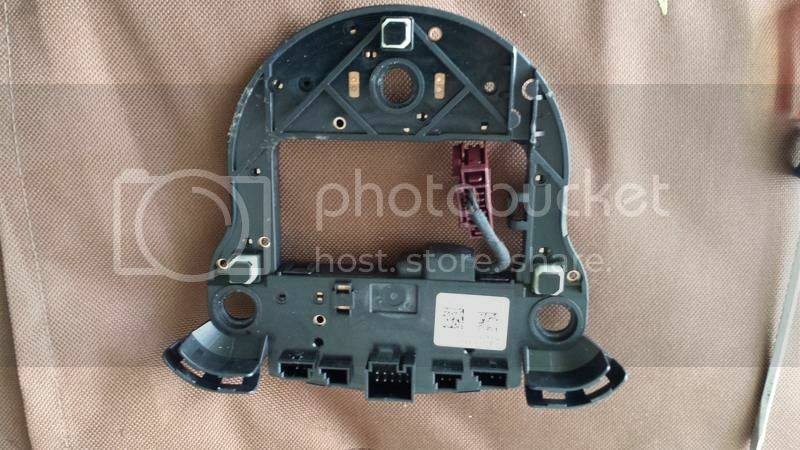 This is part of the factory harness, so no way to really by pass that without reinventing the wheel.